Coupons to fill your basket with Easter savings! To celebrate Easter, we are giving 10% off all orders until April 21st! See how much green you can save by switching to e-cigarettes. 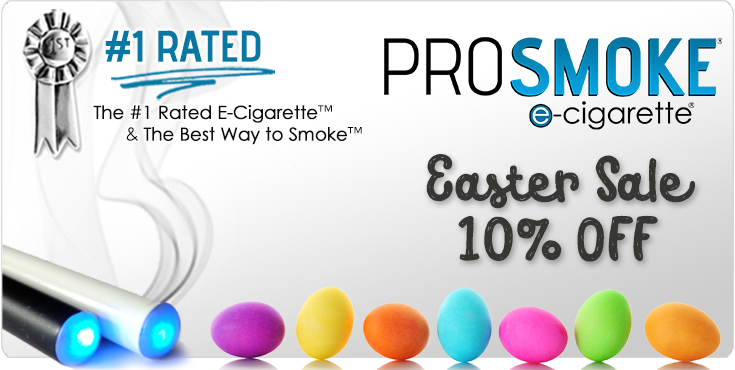 Happy Easter and Spring from ProSmoke! Use coupon code 'Easter19' at checkout! More info here. All Electronic Cigarettes are not equal! Shopping for an e-cigarette can be a confusing experience. ProSmoke has earned our #1 Rating, so you can be comfortable that you have have all the information and resources you need to make an informed purchase that you will always be happy with. Browse through our site to see why ProSmoke keeps getting rated the the best e-cig on the market. 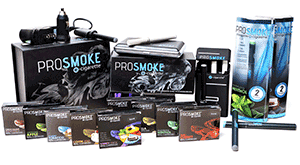 CBS recently featured ProSmoke and concluded were best! 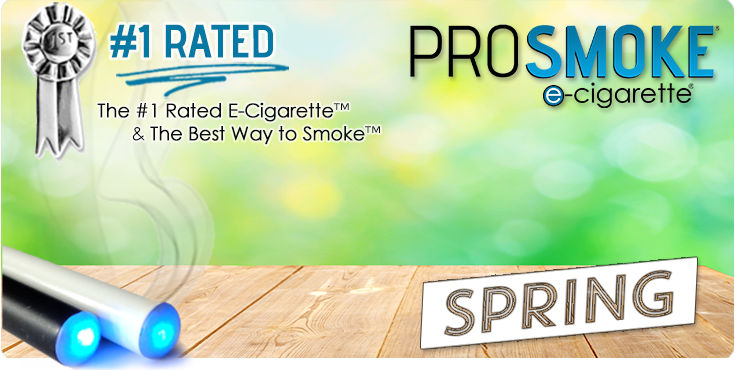 "Many companies have established themselves as a staple in their industry...For facial tissues, one might think of Kleenex; For search engines, Google is certainly a popular choice....(ProSmoke) positioned themselves as the electronic cigarette of choice. 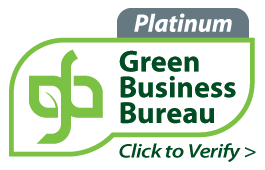 The standard has been set..."
ProSmoke is excited to be the first & only electronic cigarette company in the industry that has been certified by the Green Business Bureau as a Green American Business. This certification exemplifies our dedication to being the top company in the market while continuing to provide the best e-cigarette products. The best rewards program available in the industry. Every time you make a purchase through ProSmoke, you earn rewards Points. You can also earn points by referring friends, posting honest online reviews of your positive experience with ProSmoke, and more. The Best Ratings For The Best E-Cigarette! ProSmoke continues to be recognized as the industry's best performer and top electronic cigarette. With one of the most reviewed products on the market, ProSmoke gets top ratings in Taste, Vapor Production, Customer Service, Looks, Shipment Speed and Value! Check out official reviews here! We offer electronic quit smoking products better than green smoke, blu cigs, smokinganywhere, southbeach smoke, V2 cigs, greensmoke, smoke 51' and any smokeless cigarettes to help you kick the nicotine habit with electronic cigarettes. ProSmoke is proud to announce that every month, we donate a portion of proceeds to various cancer charity organizations and get involved locally ,as well as nationally for events to fight cancer and find the cure. E-cigarettes are not a quit smoking tool and are not intended in any way to treat or help with diseases, however we encourage everyone to get involved by donating today! Want to see what other people are saying about ProSmoke and our competition? Make sure your\'e investing in the right product by checking out our reviews section. Our product has earned its #1 e-cigarette rating and now you can see why others agree. CHECK OUT CUSTOMER VIDEO REVIEWS HERE! Awarded the Favorite Place on Google! ProSmoke was just recognized and awarded the rare distinction of being a "Google Favorite Place"
Less than 1% of all U.S. businesses receive this and it is quite an honor. Look for our QR codes at local distributors and check out new products that helped us be selected for this prestigious distinction! 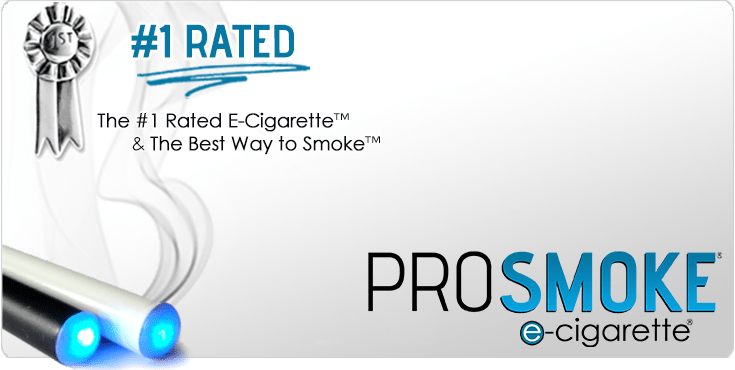 ProSmoke electronic cigarettes produce the most vapor of any mini electronic cigarette in the industry, last the longest, taste the best, & are the only Green Certified product in the industry. That's why our customer surveys vote us as #1. Enjoy traditional flavors like Classic Tobacco or mix it up with our other delicious e-cigarette flavors that are sure to satisfy your taste buds! They are made with vegetable based ingredients and cost less than the competition! ProSmoke batteries and cartridges last longer than any other e-cigarette in its class. There is no need to carry handfuls of electronic cigarette cartridges with ProSmoke. We have the lowest cost of ownership in the industry. Buy with confidence! Our new 40,000 square foot electronic cigarette headquarters, manufacturing, testing and main warehouses are located in Chicago, IL, NOT overseas and are fully certified. Customers Agree we're the best! Over 99% of customers surveyed rate our product and customer service as excellent. Thousands of websites, customer, and YouTube reviews show how much people really love their ProSmoke e-cigarettes. As the ONLY Green Certified company in the industry, you can be Eco-friendly while using our e-cigs. In addition, our e-liquid and cartridges all use Vegetable based liquids instead of other chemical options like our competitors. Our quality is beyond par. Our electronic cigarette gives you the familiar feel of a real cigarette, that will last you a lifetime. We offer the best e-cigarette & tobacco alternative on the market. Don't settle for substitutes when you buy your electronic cigarettes. Don't want to deal with overseas shipments? Good, you won’t have to! Our electronic cigarette warehouses are located throughout the U.S. for your convenience and speedy shipping.